Defense minister meets his US counterpart in Washington, says Syria and Hizbullah eroding Israel's qualitative advantage. Defense Minister Ehud Barak met with his American counterpart, Robert Gates, in Washington Monday. The two reportedly discussed various issues pertaining to maintaining Israel's qualitative military advantage over its neighbors, the Iranian threat, and the situation in Lebanon, as well as continuing the nations' cooperation on active defense systems against rockets and missiles fired at Israel. Barak also tried to convince Gates that the US military should purchase Israel-produced Namer [pronounced Nuh-MEHR, the word means 'tiger' in Hebrew] infantry fighting vehicles. 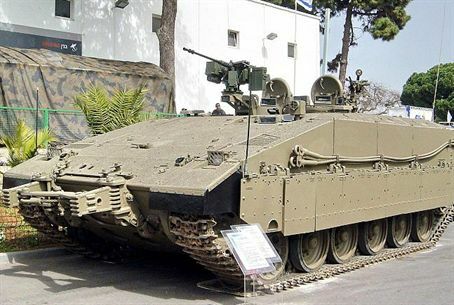 The Namer IFV is based on a Merkava Mark IV chassis and armed with either M2 Browning machine gun or Mk 19 grenade launcher mounted on a Samson Remote Controlled Weapon Station, It also has another 7.62 mm MAG machine gun and a 60 mm mortar. Namer carries up to 12 crewmen and infantrymen and a stretcher, or two stretchers and medical equipment. Barak told Gates that the Jewish state is concerned over the continued bid by Syria and Iran puppet army Hizbullah to arm themselves with sophisticated weapons that could dent Israel's qualitative advantage over them. Barak was also scheduled to meet CIA director Leon Panetta, National Security Adviser Tom Donilon and Vice President Joe Biden.